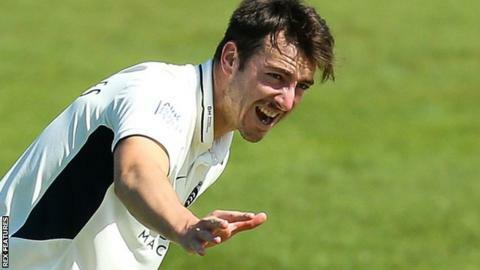 Middlesex and England fast bowler Toby Roland-Jones will miss the remainder of the season with a back injury. The 30-year-old has suffered a recurrence of a stress fracture which ruled him out of the winter's Ashes tour of Australia. Roland-Jones made his Test debut against South Africa at The Oval in 2017 and has taken 17 wickets in his four Test appearances to date. He will now be out during an extended period of rehabilitation. Roland-Jones was unable to bowl in the second half of Middlesex's most recent match, the County Championship defeat by Derbyshire, and scans have subsequently revealed another stress fracture to his lower back. "Everybody at the club is devastated for Toby and our immediate thoughts are with him, and that he makes a full recovery," Middlesex managing director of cricket Angus Fraser said. "Toby's absence is obviously a setback for Middlesex and he will be missed for more than just his bowling. "He's a fantastic presence in the dressing room and has been one of the finest bowlers in the country in the past six or seven years." The right-armer took 5-57 on his Test debut last July, finishing with match figures of 8-48 as England beat South Africa by 239 runs. Roland-Jones had helped Middlesex win the County Championship title the previous year, taking a hat-trick to secure a pivotal victory over Yorkshire in their final match.